You’ve seen the videos – you know lots of dogs go bonkers for peanut butter. It makes a great training treat too. But before you grab a jar and a spoon, it’s important to know that not all peanut butter is safe to give your dog. Here’s what you need to know. Yes and no. Dogs can eat some kinds of peanut butter, but you need to check the ingredient list first. Avoid any that contain an artificial sweetener called xylitol. This ingredient is safe for us but toxic to our dogs. Xylitol isn’t just in peanut butter – look out for it in things like yoghurt and toothpaste too. Related blog: What foods are harmful to dogs? What if my dog eats peanut butter with xylitol? 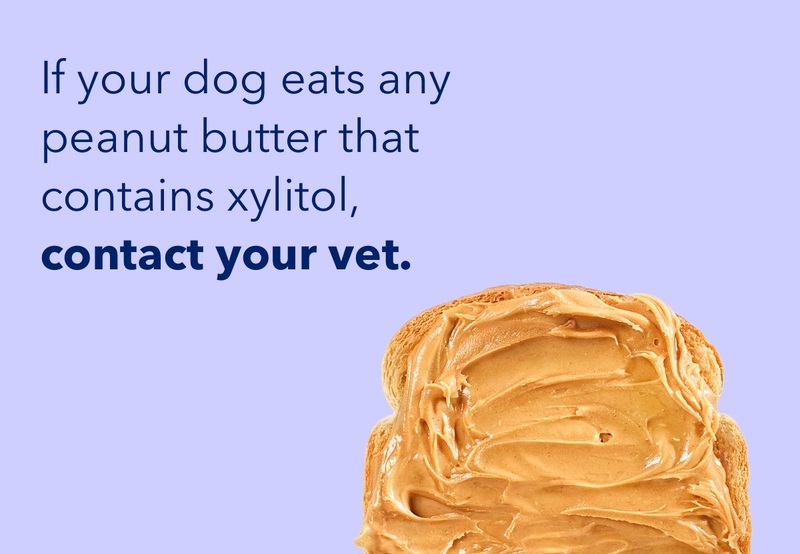 If your dog eats any peanut butter that contains xylitol, contact your vet – even if it was just a nibble of your PB on toast. It’s best to be on the safe side when it comes to xylitol poisoning. Is xylitol-free peanut butter healthy for dogs? High protein content – including a high level of the amino acid arginine, which supports your dog’s heart, lungs, kidneys and immune system. Contains flavonoids – which help control blood sugar and support your dog’s immune system. Energy-rich – great for pups who need lots of fuel to grow. High in calories – too much can lead to weight gain, especially for older dogs who don’t need the extra energy to fuel their growth. Added salt and sugar – both can be detrimental to your dog’s health, so avoid brands that include them. Unhealthy accompaniments – skip the classic PB&J as jam contains too much sugar for dogs. As long as you read the jar carefully, peanut butter can be a delicious treat for your dog, and a great way to motivate them during training. Want more information on peanut butter for dogs? Get in touch at hello@tails.com. Can dogs eat human snacks?